Put the oven rack in the middle position and preheat to 375 F (190 C). Grease a muffin pan. If you have a non-stick muffin pan, you can just drizzle a little oil onto a paper towel, and then wipe each cup to grease them. If your pan is not non-stick, you'll need to grease it, and then dust each cup with some flour, dumping out any excess by flipping the pan over and tapping it on a hard surface. Add the flour, baking soda, and salt to a bowl and whisk together to combine evenly. Add the eggs, yogurt, peanut butter, butter, maple syrup and vanilla to a blender and blend until smooth. Pour the peanut butter mixture into the dry ingredients and fold together until it just forms a batter and there are no big lumps of flour. Be careful not to over mix the batter. Fill the muffin cups halfway, and then use a spoon to make an indentation in the center of each muffin. 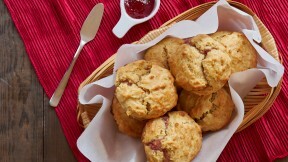 Add 2 teaspoons of jam into the indentation of each muffin. Top with the remaining batter, sealing the jam in. Bake the muffins for 20-25 minutes, or until a toothpick inserted into the center comes out clean. Remove the muffins from the oven and let them cool for 5 minutes before removing from the pan. You can cool them completely on a cooling rack, or serve them warm.